After a decade and a half, Police VISOR Lights have finally been catapulted firmly into the 21st Century! The Revolutionary Interactive BLAZE CORE™ Technology gives you THREE high intensity lights in the space of One! Generation IV, 3-Watt emergency LEDs have been reconfigured creating a formidable light force that shines brighter...and farther and….wider through TIR lenses. With BLAZE TECHNOLOGY 2 LEDs, each 3 Watts, have been squeezed into the space of one! There is NO DOUBT, when you see the Blaze Core™ Takedown Technology Visor Light at a great distance, you’ll mistake it for a full-size light bar; that’s how bright it is and how far it shines. Need to direct traffic...NO Problem; BLAZE is a Traffic Advisor, too! HIT the Takedown toggle switch and ‘instantly’ BLAZE visor light changes from color to 96 Watts of brilliant white light! 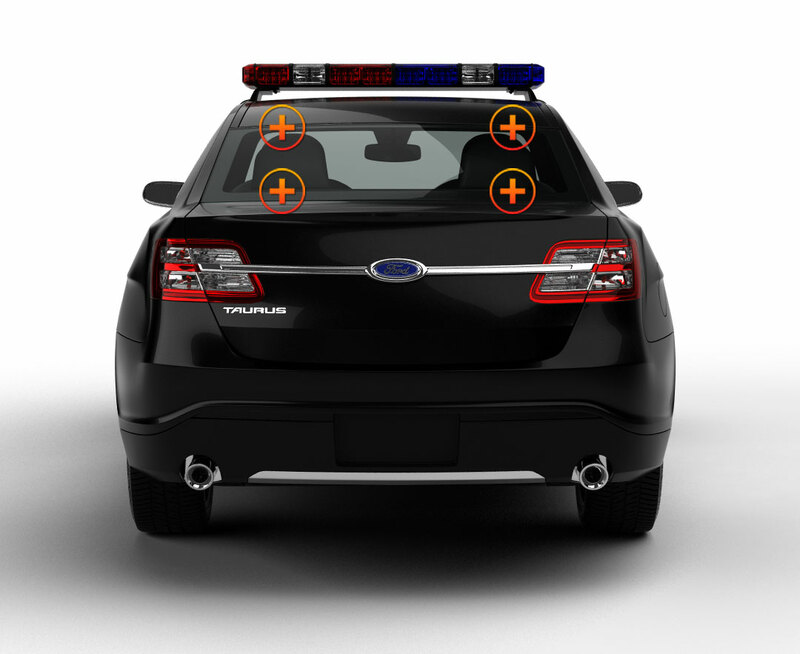 In just 34”, you’ve got a blinding Takedown light, a versatile Traffic Advisor that flashes Left/Right or Right/Left, and an exceptional police emergency light with brilliant illumination that flashes in 26 pre-programmed flash patterns with pattern memory. There are 13 color options, solid or split-color combinations. ETD hasn’t cut any corners with this light either. The housings are made of the same high-grade aluminum, and the TIR lenses are virtually indestructible polycarbonate material. Everything that ETD sells, including BLAZE, meets or exceeds industry standards, both nationally and internationally. The power pack fits into the cigarette lighter plug and has easy-to-reach flash pattern and Takedown controls. It comes with a 9’ cable and visor brackets for quick installation. 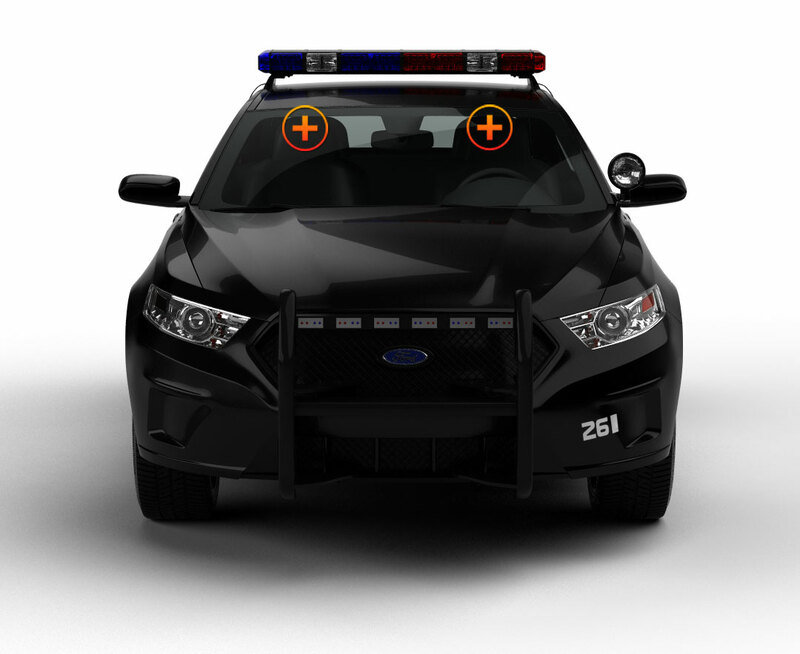 There is NO DOUBT Blaze Takedown Technology takes police emergency lights to a higher level. ETD engineers have done it! They have given our customers what they have been asking for...More Light, More Functions, LESS Wires, and More Versatility...ALL for an Unbelievably LOW, LOW PRICE! This light offers multiple choices including directional which is exactly what I needed for my job. Easy to install and super bright. Love the takedown function. Super Impressive LED Light. The LED lights on this thing are so bright. It was a simple install for me. I just Installed my Visor Light and this thing is bright as all get out. I love this light. The takedown function they call Blaze Core is awesome. ETD has hit a Home Run with this light. I have it mounted in my Ford F-150. The Blaze function they have on this thing is amazing. This is a great product if you want the brightness of a full-size LED light bar in a visor light. It's about three times as bright as most other lights of a similar size. Really really bright and the full takedown is excellent. This is ultimately a great value light bar. Can't knock the 5 year warranty either. I was worried about whether the installation would be a problem, but it actually went in fairly quickly. There are visor brackets for added stability along with the cord, which is also easy to work with. After I finished installing it and testing, the bar didn't budge one bit. Another thing I like about the light is how bright it is. I've used other light bars that are about the same size but not nearly as clear and bright. The product is a fantastic value for the price since you get a warranty of five years with it. If I had to pick one word to describe this light, it would be versatile. It's a cinch to switch it from one mode to another with the toggle switch. There are actually 26 flash patterns, which you can also set to memory. Received mine a couple days ago...very visible in the day and intense at night with no flashback on windshield. All said and done I am pleased with the light and it's performance. My new Blaze Core came in today. The processing and shipment was very fast! The lights are bright and well worth the money. I will be ordering more lighting and equipment from ETD soon. This Visor light is absolutely amazing. I can not believe the amount of light it puts out. I love the takedown option it is so bright. I also like that this cost a lot less than the competitor. I ordered this light as additional lighting for my Chevy Tahoe. It is now my main lighting as it blows all my other lights away. As a police officer it is critical when I pull up on a scene at night that if I need to see in the dark I have a takedown light that is powerful enough to do it. This Blaze technology is sick. I can simply hit the switch and it stops flashing red and blue and every single LED changes to white making it so easy to see what is going on in front of my vehicle. I got the Amber version for my tow truck. It definitely helps when pulling up to an accident and activating the white lights. They are able to provide enough light to see what is going on. Amazing product at a great price. I needed a light for my POV as I am a volunteer firefighter. A lot of my calls come at night so having the Blaze takedown function is actually quite amazing. I can not believe the amount of light that this unit produces. I will be adding a set of the Elemental 6 lights next. I just got mine. I ordered this unit and it took 4 days to get here from the day I ordered it. I ordered this light for the Super Takedown ability. It only took me about 20 minutes to install and it is in my Dodge Charger police vehicle. This visor light for the price competes with the likes of Whelen and the other major brands. The aluminum housing is super heavy duty and I do not see any issues with this light.